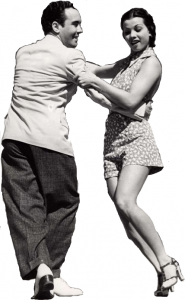 Like many swing dance styles the Balboa dance is a contemporary of the Lindy Hop. Unlike some swing dance styles that originate from the southern states of the USA, this one takes its roots from California on the West Coast. It is said to have originated in the 1930’s. The Balboa dance is a partner dance where each partner connects at chest level and uses footwork which is both intricate and small making it well suited for crowded floors and fast music. Fancy spins and other flashy moves are something you can also see in the Balboa Dance. Being a jazz style dance means this style can be danced to older jazz styles such as Dixieland as well as swing music. Looking for a Balboa Dance School on the Gold Coast? Our regular swing dance nights are a perfect opportunity to join a class where you can learn and refine your dance moves as well as let loose for some social dancing. Each night also has a separate class during the evening to cater for intermediate and advanced dancers. One low fee for each night lets you enjoy any or all the swing dance classes for the entire evening. Why not come along and make some new friends while getting fit and having fun at the same time. For bookings and enquiries give us a call at Swing On In Dance School. Our swing dance studios are located on the Gold Coast and in Bangalow (NSW).